The elusive and unusual Rail-babbler (left and below, in some very impressive shots by Murray Lord), often called Malaysian or Malay Rail-babbler, is an enigmatic ground-dwelling denizen of lowland primary forests in peninsular Thailand and Malaysia, and on Sumatra and Borneo. It was traditionally considered a babbler (hence the name) and is retained in the Timaliidae by such recent works as MacKinnon & Phillipps (1993). More often, though, it is included with a group of secretive, mostly forest-dwelling birds of Australasia, such as logrunners, quail-thrushes, whipbirds, and jewel-babblers. 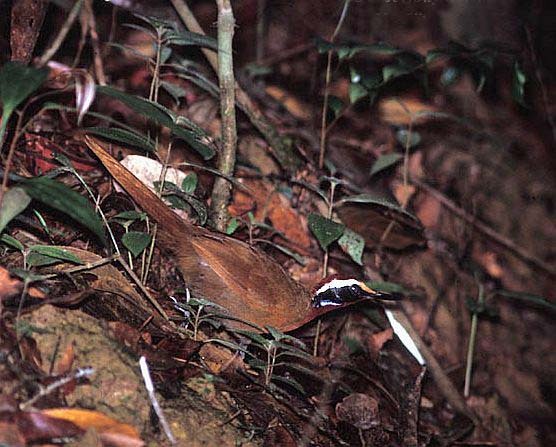 The rail-babbler is superficially similar to those birds as it forages by walking on the forest floor, sometimes giving a penetrating whistled note that recalls jewel-babblers and some pittas. Initially, the logrunners and quail-thrushes (and rail-babbler) were listed as within the family Orthonychidae. Then Sibley & Ahlquist (1990) split out the logrunners as their own family, the Orthonychidae. Rail-babbler remained with the quail-thrushes of Australia, and for a while the groups was known as the Cinclosomatidae (Sibley & Ahlquist 1990, Sibley & Monroe 1990). More recently, based on further DNA analysis, quail-thrushes were separated out as a distinct family, the Cinclosomatidae (Dickinson 2003, Cracraft et al. 2004). This left rail-babbler with the whipbirds, wedgebills, and jewel-babblers. As it had the oldest name, the rail-babblers genus gave rise to the family name Eupetidae. This has changed again. Dickinson (2003) warned that studies might show that rail-babbler was not closely related to any of these birds. The first of those studies has now appeared as an on-line but formally published letter in an ornithological journal (Jønsson et al. 2007). Analysis of molecular evidence shows that Eupetes is nested within the Picathartes/ Chaetops (rockfowl/rockjumper) clade, with its closest relatives being the rockjumpers in genus Chaetops that are endemic to South Africa. The molecular clock used suggests that the Picathartes/Chaetops/Eupetes clade diverged from the ancestors of the Australian robins [Petroicidae] in the order of about 48 million years ago. Picathartes [rockfowl] and Eupetes [rail-babbler] then diverged from Chaetops [rockjumpers] about 4 million years later. I believe that this degree of divergence warrants family status for all three groups. Jønsson et al. (2007) note that the "distribution of Picathartes, Chaetops and Eupetes would then be relictual, following a range expansion whereby this clade spread out of Africa. Eupetes retreated into the rainforests of the most southeastern part of mainland Asia and the closely associated islands of Sumatra and Borneo." They consider this scenario to be more consistent with the evidence than a dispersal event from Australia to Asia to Africa. Further studies, though, may throw more light on these theories. Remarkably, Serle (1952) pointed to a series of similarities between rail-babbler and rockfowl: similar proportions, position of nostrils, shape of forehead and tail. He did not insist there was a relationship but his insights proved prescient. Rather little is known about Eupetes (left, in a fine and difficult shot by Ong Kiem Sian). Lekagul & Round (1991) describe it as "usually solitary, shy; stays on the ground, walking with measured gait and jerking head like a chicken. . . [Gives] a drawn out monotone whistle of about 1.5 to 2 seconds duration. Purer in tone and higher-pitched than the similar whistle of Garnet Pitta and sometimes with an almost imperceptible drop in pitch at the end." Sexes are alike. Fortunately, it often calls regularly, and that is the key to finding and then actually seeing this difficult bird. 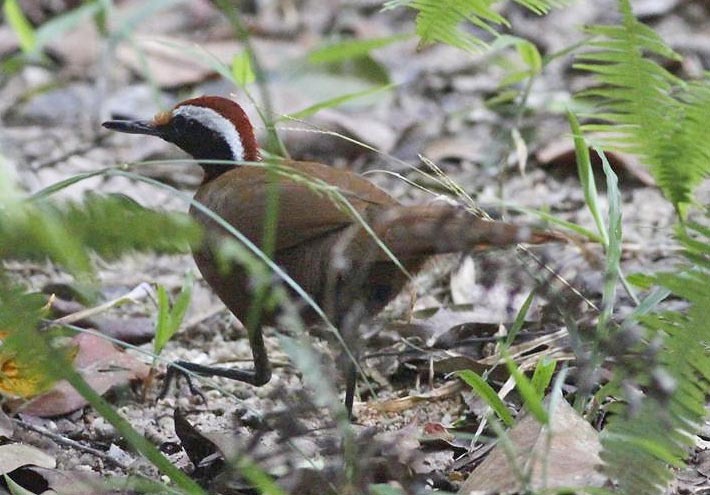 Photos: Both Murray Lord and Ong Kiem Sian photographed the Rail-babbler Eupetes macrocerus in the Panti Forest, Johor, peninsular Malaysia. Murray's photos were in Sep 2011; those by Ong Kiem in May 2004. Photos © Murray Lord & Ong Kiem Sian, used with permission; all rights reserved. Bibliographic note: There is no "family book" and the Handbook of the Birds of the World series did not assign it a separate family. Lekagul, B., and P.D. Round. 1991. A Guide to the Birds of Thailand. Saha Karn Bhaet Co., Bangkok. MacKinnon, J., and K. Phillipps. 1993. A Field Guide to the Birds of Borneo, Sumatra, Java, and Bali. Oxford Univ. Press, Oxford.